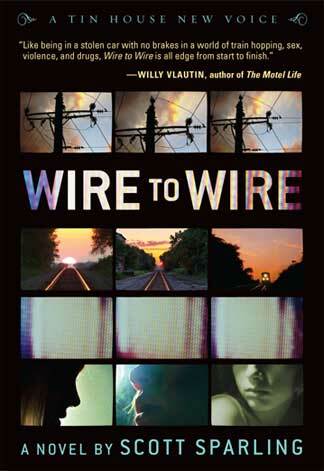 WIRE TO WIRE is set in Northern Michigan in the late 1970s. It's a story of trains, glue, money, and love, with love being the most dangerous. The town of Wolverine, on the edge of Lake Michigan, is a refuge for the damaged—“where everyone is working an angle and it’s never the angle you think.” Michael Slater arrives in Wolverine with more problems than most. He was standing on a moving boxcar when a power line kissed his skull; now he sees things that aren’t there. For me, Wire to Wire is a story about the thrill of hopping freights, the strange beauty of Northern Michigan, and the pain of falling for someone right down to your blood and your bones. It's literary fiction with a plot. Wire to Wire is a smart and beautiful book about losers—aimless, glue sniffing, speed freak, train hopping, mostly rural, accidentally homicidal losers. [Sparling's] prose is so good, his characters so vivid and the pace so gracefully relentless that we willingly jump on the train to nowhere as it slices through the chilly northern Michigan night, in the company of Slater, who perceives with gorgeous intensity and is virtually incapable of deciding anything, of Harp the adventurer, obsessively compulsive in his rail riding, of lovely, damaged, heroically addicted Lane, who sleeps with both of them. A gaggle of finely drawn secondary characters populates the alternating here and nows the story moves between, not a stereotype among them, while the narrative engine gains speed as implacably as a bullet train or a Greek tragedy. All this sounds terribly serious, but Sparling’s spare prose comes with a glint of wit and a persistent quirky intelligence that does two singular things—it completely seduces the reader and convincingly asserts that even the most hapless among us lead rich and complicated lives. While riding a freight car through Detroit, Michael Slater suffers a near-fatal accident—a power line to the head. After a questionable recovery and a broken relationship, he abandons his new home in the Arizona desert, but not before leaving a man for dead. Slater returns to Michigan in a busted-up Ford to reunite with an old train-hopping pal, but quickly discovers that the Pleasant Peninsula of his youth is none too pleasant. As Slater’s past catches up with his present—a love triangle, a local drug dealer, the damaged residents of a destitute Northern Michigan town—rock bottom keeps slipping farther away. In the end, we went with a quote from the Tao Te Ching—"In action, watch the timing"—and the Michigan state motto: "If you seek a pleasant peninsula, look about you." Scott Sparling lives near the railroad tracks in Sucker Lake, Oregon, a place that might or might not exist. He grew up in Michigan, graduated from Antioch College in Ohio, and now runs Segerfile.com.